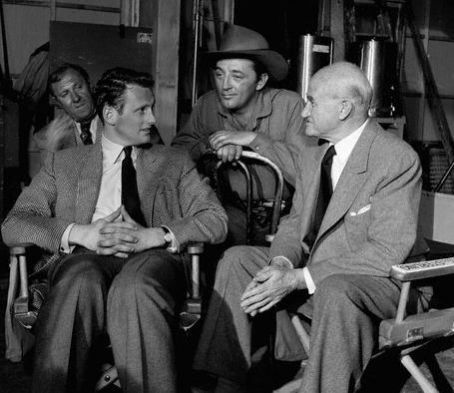 Samuel Goldwyn Jr., Robert Mitchum and Goldwyn Sr.
Samuel Goldwyn Jr., who passed away yesterday at age 88 at Cedars-Sinai Hospital, was the son of producer Samuel Goldwyn and his wife Frances Howard. 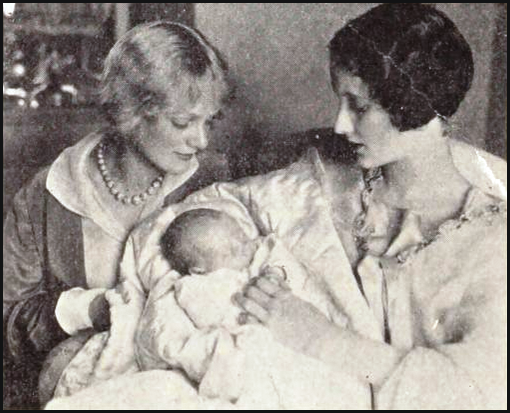 On Tuesday, September 7, 1926, at 4:15 am, Frances gave birth to her son at Good Samaritan Hospital (weighing seven and one-half pounds), only hours before most members of the film capitol was at Hollywood Cemetery saying their final good-byes at the funeral of silent film idol, Rudolph Valentino. Goldwyn Sr. took time away from the hospital that day to be a pallbearer for Valentino, a last minute replacement for Norman Kerry who injured his leg on a film set. look upon new-born Samuel Goldwyn Jr. Tags:Frances Howard, Rudolph Valentino, Samuel Goldwyn, Samuel Goldwyn Jr.
Anita Page, the last great silent film star from Metro-Goldwyn-Mayer, would have celebrated her 100th birthday yesterday. Some argue whether she was a star, an actress or leading lady — to me she was all of the above and more. Anita was the first real actress that I had a chance to know personally. I first met Anita Page in 1993 when I was researching my biography on Ramon Novarro, whom she costarred with in the 1929 film, The Flying Fleet. Her husband had passed away two years earlier, so to keep busy she came out of retirement and began appearing at film festivals and other functions. At the time she was living in a retirement center in Burbank. Her good friend, actor Randal Malone, set up the interview. Anita was very sweet and accommodating to my questions. She had suffered a stroke after her husbands death which affected her short term memory. Her long-term memory was still intact, however she sometimes forgot that she had told a story and would repeat it. Other than being a little frail, that was the only noticeable evidence from her stroke. Only once during the interview did she hesitate repeating information about Novarro. It was about his height. Evidently Novarro was not tall – probably about 5’8” – so he sometimes wore lifts in his shoes depending on his costar. Novarro wanted Anita to appear in the film with him, but the studio felt she was too tall and wanted to use Josephine Dunn instead. Novarro told the executives, “I can always wear lifts in my shoes. Besides, I did a film with Joan Crawford and she’s as tall as Miss Page.” As we know Anita got the job, however, she thought the information about his height might be embarrassing so she asked that I turn off my tape recorder before she would tell the story – which of course I did. I became friends with Anita and Randal that day and over the ensuing years was invited to their homes and to events where Anita was appearing. 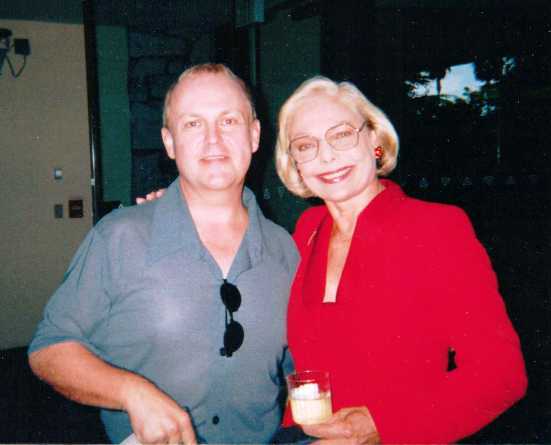 I also began interviewing her over a period of a year for a proposed book on her career. Whether it was at a noisy restaurant, her home or some other venue, I showed up with a tape recorder and we talked about early Hollywood. During that time she relayed stories about her films and the famous people she worked with and knew. I completed a rough draft of what was to be the text for a coffee table book, but sadly it never came to fruition. I did, however, donate a copy of the unedited manuscript to the Margaret Herrick Library under the title, “Anita Page: You Were Meant For Me,” so future film historians will have access to her stories. 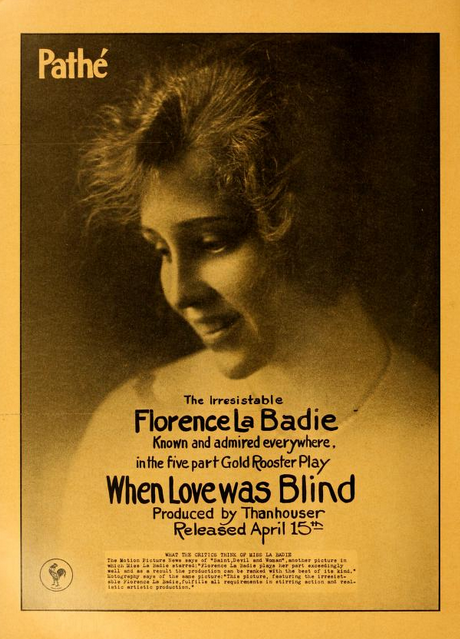 The title is from the song by Nacio Herb Brown, her short-lived husband, who wrote it for Broadway Melody (1929) and dedicated it to her. 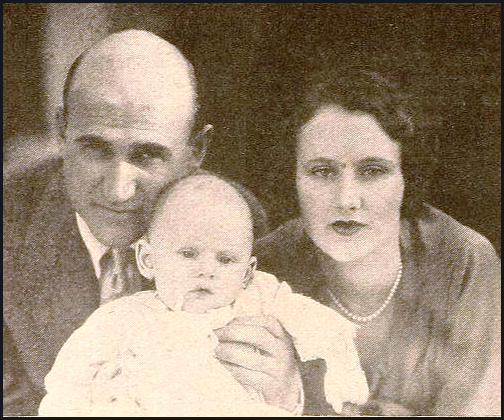 Anita with her parents (above), Maude and Marino Pomares. Mrs. Pomares died from cancer at her Manhattan Beach home in May 1943. 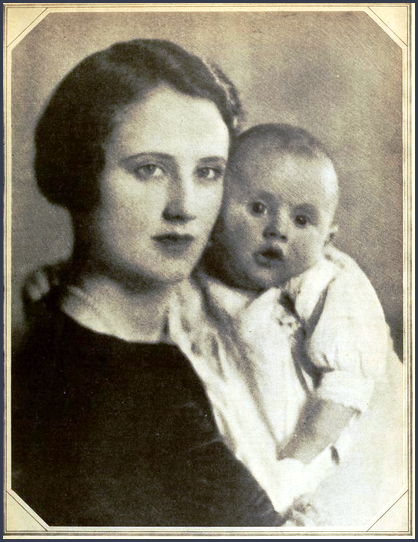 A few years later her father remarried and he passed away in 1951. They are buried at Holy Cross Cemetery in Culver City. Anita also had a younger brother, Marino, Jr. who died in 1960 from a brain tumor. He was 36. Above is a Los Angeles Examiner photo announcing Anita’s first arrival in California on December 7, 1927. She was a protégé of Harry K. Thaw who brought her and another starlet, Susan Hughes to California to make films. While Thaw’s plans failed, Anita (who was known then as Anita Rivers) decided to stay in Hollywood and try to make it on her own. Thaw returned to New York, as did Susan Hughes, who gave up show business. When I first interviewed Anita, she talked about her first Hollywood apartment that she shared with her mother. It intrigued me so I went about trying to find it using the phone book. Sure enough, there was a listing for Mrs. Marino Pomares in the 1928 directory – 7566 ½ De Longpre Avenue. Randal and I took Anita to the address for a photo shoot. Unfortunately the tenants were not home so we didn’t get a chance to look inside. When Sunset Boulevard, the Andrew Lloyd Webber musical came to Los Angeles, Anita received an invitation to attend. A real silent film actress meets a fictional silent film actress — what great publicity! Randal graciously asked me to attend along with his friend Michael Schwibs. The four of us had the best seats in the house – fourth row center – all compliments of the theatre. The play was breathtaking and the performances top rate. Afterward we went backstage to personally meet the star of production, Glenn Close who played Norma Desmond. Ms Close was still in costume and in character and had a brief conversation with Anita. It was a great experience and Ms Close kindly signed my program. What a night. Sigh — our hero: Flynn with his schnauzer Moody on the set of “Never Say Goodbye” in 1945. Movie audiences have always embraced their swashbuckling screen heroes, and this year marks the centenary of arguably the greatest, Errol Flynn. Mostly, Flynn is remembered for portraying a free-spirited adventurer who dispensed swift justice to oppressors, while extending a gentle hand of chivalry to ladies in need. Born on June 20, 1909, in the southern Australian state of Tasmania, Flynn lived life hard off-screen, too. In just 15 short years, from 1935 until his death 50 years ago, he racked up dozens of classic performances and a professional legacy that endures. These days, swashbucklers are more likely to be called “action heroes,” who trade in their sabers for guns, bullwhips or light sabers in franchises such as “Indiana Jones,” “The Mummy” or “Star Wars.” More recently, after plundering almost $3 billion at the box office worldwide, the success of the “Pirates of the Caribbean” trilogy suggests that sword-wielding adventurers have retained their charm. But whatever their title or weaponry, these characters are little more than reincarnations of dashing screen legends, such as Flynn.